USES: Ethambutol is used with other medications to treat tuberculosis (TB). 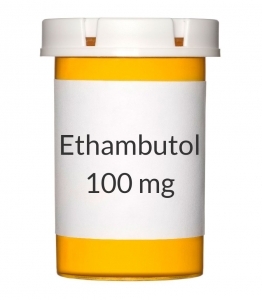 Ethambutol is an antibiotic and works by stopping the growth of bacteria. This antibiotic treats only bacterial infections. It will not work for viral infections (such as common cold, flu). Unnecessary use or misuse of any antibiotic can lead to its decreased effectiveness. OTHER USES: This section contains uses of this drug that are not listed in the approved professional labeling for the drug but that may be prescribed by your health care professional. Use this drug for a condition that is listed in this section only if it has been so prescribed by your health care professional. This drug may also be used with other medications to help treat a certain serious infection (Mycobacterium avium complex-MAC). It may also be used with other medications to prevent the MAC infection from occurring again in people with advanced HIV disease. HOW TO USE: Take this medication by mouth with or without food, usually once daily or as directed by your doctor. This medication may sometimes be taken twice weekly. Take this medication exactly as directed by your doctor. If you also take antacids that contain aluminum, take this medication at least 4 hours before the antacid. The dosage is based on your age, weight, medical condition, and response to treatment. Antibiotics work best when the amount of medicine in your body is kept at a constant level. Therefore, take this drug at evenly spaced intervals. To help you remember, take it at the same time each day. Continue to take this medication (and other TB medications) until the full prescribed amount is finished, even if symptoms disappear. Stopping the medication too early or skipping doses may allow the bacteria to continue to grow, which may result in a return of the infection and cause the infection to be more difficult to treat (resistant). Tell your doctor if your condition persists or worsens. SIDE EFFECTS: Headache, loss of appetite, upset stomach, or nausea/vomiting may occur. If any of these effects persist or worsen, tell your doctor or pharmacist promptly. Remember that your doctor has prescribed this medication because he or she has judged that the benefit to you is greater than the risk of side effects. Many people using this medication do not have serious side effects. Tell your doctor immediately if any of these unlikely but serious side effects occur: vision changes (such as blurred/decreased vision, color blindness), symptoms of liver disease (such as persistent nausea/vomiting, unusual tiredness/weakness, severe stomach/abdominal pain, yellowing eyes/skin, dark urine), numbness/tingling of arms/legs, toe/joint pain. Tell your doctor immediately if any of these rare but serious side effects occur: mental/mood disorders (such as confusion, hallucinations), signs of a new infection (such as fever, persistent sore throat), easy bleeding/bruising. A very serious allergic reaction to this drug is rare. However, seek immediate medical attention if you notice any symptoms of a serious allergic reaction, including: rash, itching/swelling (especially of the face/tongue/throat), severe dizziness, trouble breathing. This is not a complete list of possible side effects. If you notice other effects not listed above, contact your doctor or pharmacist. In the US - Call your doctor for medical advice about side effects. You may report side effects to FDA at 1-800-FDA-1088. In Canada - Call your doctor for medical advice about side effects. You may report side effects to Health Canada at 1-866-234-2345. PRECAUTIONS: Before taking ethambutol, tell your doctor or pharmacist if you are allergic to it; or if you have any other allergies. This product may contain inactive ingredients, which can cause allergic reactions or other problems. Talk to your pharmacist for more details. Before using this medication, tell your doctor or pharmacist your medical history, especially of: eye problems (such as optic neuritis, cataracts, diabetic retinopathy), liver disease, kidney disease, alcohol use. Before having surgery, tell your doctor or dentist about all the products you use (including prescription drugs, nonprescription drugs, and herbal products). Alcohol may increase the risk of liver disease. Avoid alcoholic beverages while using this medication. During pregnancy, this medication should be used only when clearly needed. Discuss the risks and benefits with your doctor. This medication passes into breast milk but is unlikely to harm a nursing infant. Consult your doctor before breast-feeding. If you have HIV disease, do not breast-feed because breast milk can transmit HIV. DRUG INTERACTIONS: See also How to Use section. The effects of some drugs can change if you take other drugs or herbal products at the same time. This can increase your risk for serious side effects or may cause your medications not to work correctly. These drug interactions are possible, but do not always occur. Your doctor or pharmacist can often prevent or manage interactions by changing how you use your medications or by close monitoring. To help your doctor and pharmacist give you the best care, be sure to tell your doctor and pharmacist about all the products you use (including prescription drugs, nonprescription drugs, and herbal products) before starting treatment with this product. While using this product, do not start, stop, or change the dosage of any other medicines you are using without your doctor's approval. Keep a list of all the products you use. Share the list with your doctor and pharmacist to reduce your risk for serious medication problems. NOTES: Do not share this medication with others. Laboratory and/or medical tests (such as sputum test, eye/vision exams, kidney/liver function, complete blood count) should be performed periodically to monitor your progress or check for side effects. Consult your doctor for more details. MISSED DOSE: For the best possible benefit, it is important to take each scheduled dose of this medication as directed. If you miss a dose, take it as soon as you remember. If it is near the time of the next dose, skip the missed dose and resume your usual dosing schedule. Do not double the dose to catch up.